Tonight is the night. The audience will be waiting in Yale’s Marquand Chapel at four o’clock whether she is ready or not, though of course she will be. She’s been practicing since she was a four year old girl in Ireland, sitting with the same piano teacher her mother had when she was a child. 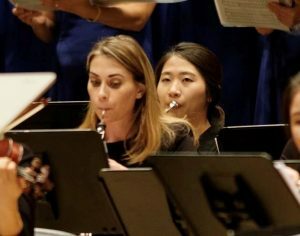 Her confidence, along with years of study and rehearsal, helps her relax and conserve the energy she’ll need to conduct her orchestra in just a few short hours. She decides to bake scones. On the other side of the world, another musician is preparing for the concert of a lifetime. She has just flown across the world to perform for an audience of 10,000. To get herself ready, the diligent musician is warming up the reeds she made for her oboe. After the pieces are perfectly fitted and ready, it’s practice, practice, practice until show time. Confident and methodical, she’s prepared to give it all she’s got. These two musicians, each incredibly disciplined and inspired, yet distinct in their approach to the craft, are music teachers at The Lewis School. Hannah Carr grew up in Ireland and plays piano and organ. Leading up to a performance, you will likely find Ms. Carr indulging in some rest and rejuvenation, a tradition that dates back to her degree recital at the Yale Institute for Sacred Music. “I prepared by baking scones for the reception,” she said. 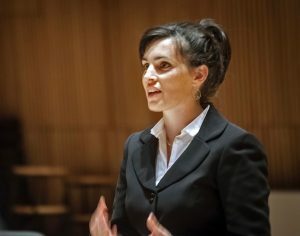 “I think it is often better to relax before something like that, whenever possible.” Today Ms. Carr counts the Yale recital as one of her proudest achievements. Dr. Marie Trudeau is also a trained pianist, in addition to playing oboe, English horn and baroque oboe. Her knowledge and appreciation for her instruments began when she was ten years old. Unlike Ms. Carr, Dr. Trudeau was raised in a home without much music. “I had to discover it myself,” said Dr. Trudeau. She joined the school band playing the oboe and loved it from the start. The student-turned-professional musician recently returned from a whirlwind trip to perform in China. “The city spent $140,000,000 to light up the buildings in the background,” she said about the event. “The audience wanted pictures and selfies with us after.” To Dr. Trudeau, this experience was the most memorable of her career thus far. Ms. Carr and Dr. Trudeau joined Lewis in the Fall of 2017 and the Spring of 2018, respectively. Along with teaching music during the day and leading choir after school, they have conducted and contributed to several performances in their time at Lewis. Both teachers see the potential in their students. “Every student at The Lewis School has music ability,” said Dr. Trudeau. “I’ve seen it! And they inspire me every day.” One such student is Sammy Kravitz, who will join Ms. Carr’s beloved womens’ choir when they perform in Hoboken, New Jersey mid-December. Sammy will join as the choir’s professional musician. When they are not practicing, teaching or performing, Ms. Carr loves to cook, paint, and relax with her new baby. You might find Dr. Trudeau at the beach, exercising or spending time with her two orange cats. Two musicians, both with nearly a lifetime of exposure and practice, each incredibly disciplined and inspired, yet uniquely distinct in their approach to the craft. Their journeys have led them both to The Lewis School where they are like two separate notes working together to create a beautiful harmony for their students.